I thought I would do this post as I finally managed after 4 years of nagging to get my husband start reading this series. 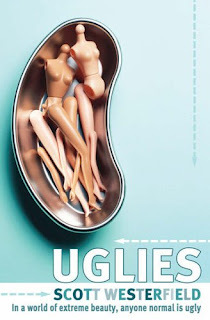 Uglies was the first dystopian novel I ever read and the main reason why I picked it up to start with was because of the cover. At school every year the library holds a book fair and I usually make an effort to go and buy something from it. This book was on the stand and it looks so weird it immediately caught me eye. I love the book because it does so many things. 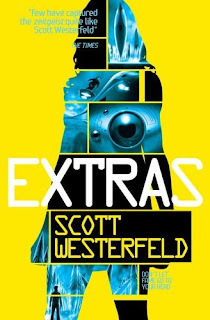 It is dystopian, and sci fi and it hits on so many themes about image and teenagers that makes it really relevant and hard hitting. I love the character of Tally as she rebels against the system and does her own thing. I love the world view set out in the book, where everyone is living in cities, with access to everything they need. At 16 they become pretty so that people don't get jealous of each other. At face value everything seems completely fair. Like with a lot of dystopian novels once you get into the story so see that all is not as it seems. You find out more about the rusties (basically us) and how the society is trying to learn from their mistakes, but also how a group outside the community are trying to break free of this seemingly perfect society and go back to living how the rusties did. I love the charcaters and their interactions with other and I love the notion of hoverboards (I want one!). Generally a fab book. The story is continued then concluded in pretties then specials. I must say I found the first book to be the strongest of the trilogy (the pretties world is a bit airheaded and bimboish which got annoying) and I didn't entirely like how Tally changed. However the series continues to be good throughout the trilogy and there are some phemonial scenes towards the end, which promise to be amazing if the series is ever made into films. Extras is a companion book to the orginal series. It is the first book I remember waiting ages for as I was desperate to read it. Having only read it once I don't remember it in huge detail (I've reread the triogly several times) but I do remember loving how it ties in with the uglies world and enjoyed seeing the world after Tally had made her impact upon it. Definately a series I would highly recommend and certainly worth a go if you've never heard of it before. 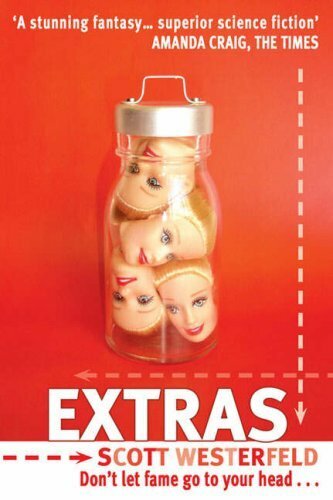 They do have a new editions of them with covers like this one. They are nice but I think I prefer the old ones! I have this series on my list of books to read. I've heard a lot of great things about it and I'm a big fan of dystopian novels. You know, I've always wanted to read this but just never got round to it.